Today I went to a Thailand Doctor who specializes in Orthopedic problems, and he is now sending me down the line to a nerve Doctor. As best I understand, and I do not speak Thai, I have “mild” degeneration of my bones, all looks great from an Orthopedic Bone Doctor point of view. However, “same same, but different” here in Thailand as in the USA, he is wanting me to talk to another Doctor specialist or neural surgeon, he used words like MRI, Neural, Tumor, Biopsy, etc, and we are stumbling down the Doctors path. The Thailand Orthopedic Doctor say he studied in Minnesota and somehow gets the word “Mild” and “Wild” confused in English. 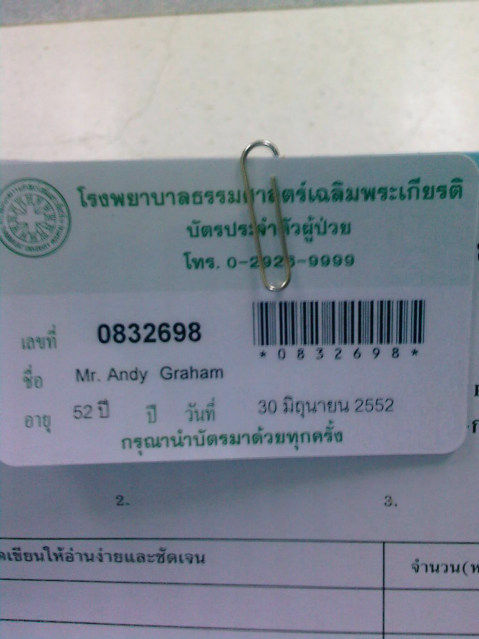 I as best I know, I am paying 50 Baht for the meeting with the Orthopedic Doctor here in Thailand. The 50 Baht included the first consultation and then again him looking at the three X-rays that were taken. I had three X-rays taken today and they cost 450 Baht. 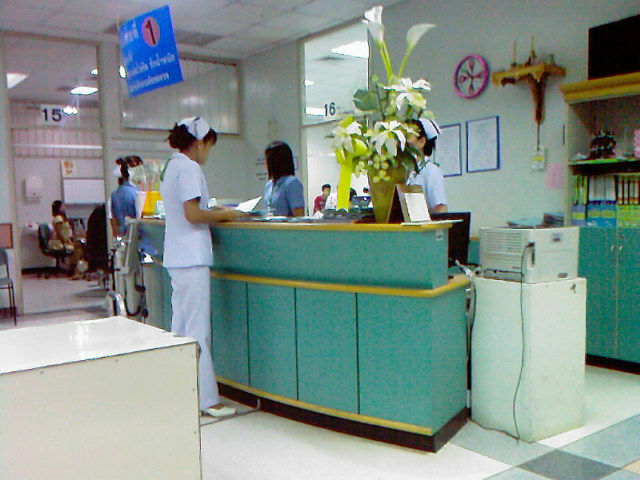 450 Baht for three X-rays. At about 34 Baht to the dollar, I am paying 14.50 U.S. dollars today. In the end, there needs to be a meeting of the minds between the doctor and the patient. I truly believe the language problems of Thailand are hazardous to my health. I believe a Thailand Doctor has a better brain than an India Doctor, better conditions, cleaner, etc, however I would be able to talk with an India Doctor better. I am sure I could have a good meeting of the minds with a Philippines Doctor, however not as strict in their standards as a Thailand Doctor, not as clean. 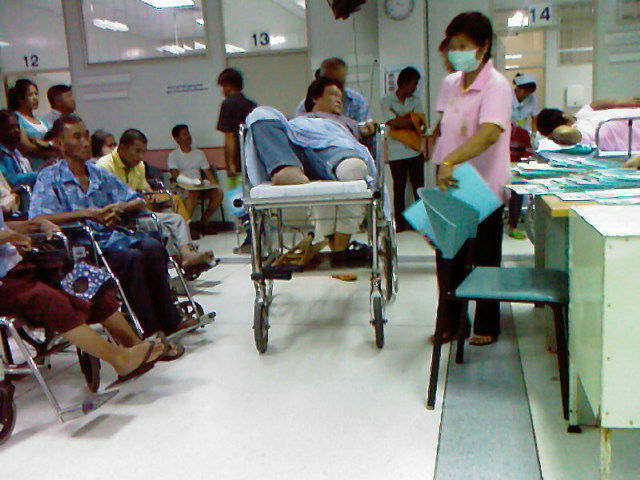 I went to the Orthopedic Doctor today in the Thammasat University Campus Hospital here just north of Rangsit, Thailand. It is roughly one hour from the center of Bangkok or maybe about 500 Baht in a Taxi from Khao San Road. I was extremely happy to be carrying my BlackBerry Storm from Verizon in my pocket. I was able to surf, read my Mobi Books, check out CNN, try to not read about Michael Jackson and play. A BlackBerry often is a better play toy than a business tool, and a great asset in a long lines waiting for a doctor to rush you through. 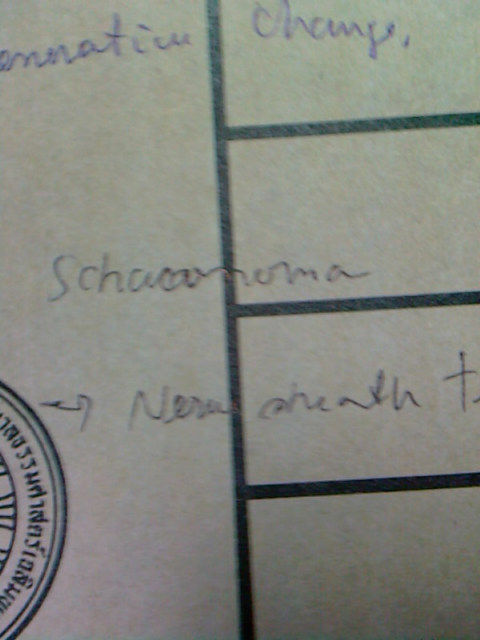 As best I can tell, these words are what the Orthopedic Doctor here in Thailand wants me to have checked by a neural surgeon, he wrote the words in English on the side of the X-rays, I took a photo with my cell phone. I did not take the photos with the BlackBerry Storm. I took these photos with a Samsung SGH900i Cell Phone, the did a Bluetooth transfer to my computer. I then use DCE autoenhance to shrink all photos to fit into a 640 x 640 box. I find the reaction time of the BlackBerry Storm too slow for photos, I have more dud photos than good quality. In the end my Canon camera is the best, however too big to be taking photos inside a Hospital, people would get angry. My sell phone remains straight, this is a disadvantage, i would rather I could pretend I was doing and SMS and take the photo. The BlackBerry works good for slow or setup photos, however for quickly spontaneous draw and shoot photos it is too slow. However, a person could easily ditch the computer and blog only from the BlackBerry or any smart phone connected to the Verizon Data service, the 170 countries is the bonus. This is perfect, the doctor wrote these words on the outside of the X-rays and then gave the x-rays to the staff. I went back and took this photo with my camera. This interpretation appears to be correct. This is an opinion of the orthopedic doctor of a possible problem. To me it feels or appears to be place where the nerves exploded outside their covers. I will go to the neural Doctor tomorrow and hopefully I can make more progress. It was called either a nerve or fat nodule by the doctor in Peru. Stumbling along the path... in the end, the worst that can happen is I die or live for another 30 years and die from it, and I would be 83.